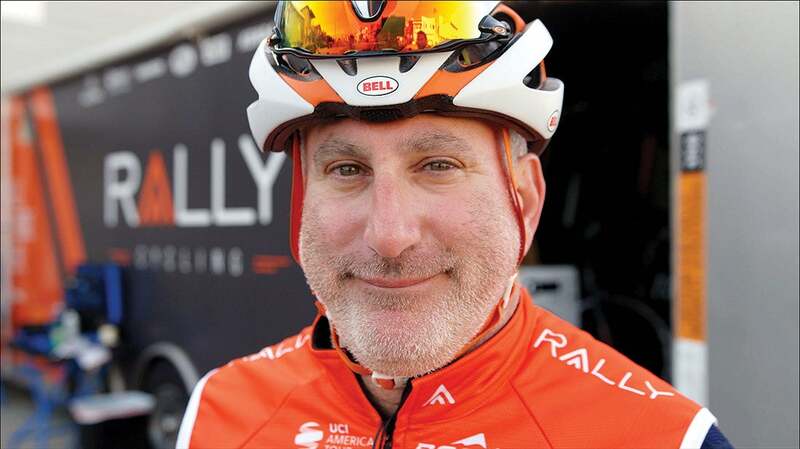 Rally Cycling's journey in professional cycling has been measured and full of success. BRANDON MCNULTY WAS WITHIN SIGHT OF THE FINISH LINE WHEN HIS LEGS QUIT. It was the fourth stage of the Tour of Oman and McNulty had embarked on a daylong breakaway into the 90-degree heat alongside his Rally teammate Robin Carpenter. One by one, his breakaway companions faded beneath the desert sun until McNulty was on his own. As he chugged up the final climb to Hatta Dam, McNulty slowed to a crawl. A charging peloton of WorldTour riders caught and passed him a few meters from the line. Seven thousand miles away in Minneapolis, Charles Aaron, owner of the Rally Cycling team, sat in his living room and watched the drama unfold on the computer. In Aaron’s eyes, McNulty’s near miss was nearly as good as a victory — it was more confirmation that Rally can compete at the WorldTour level. 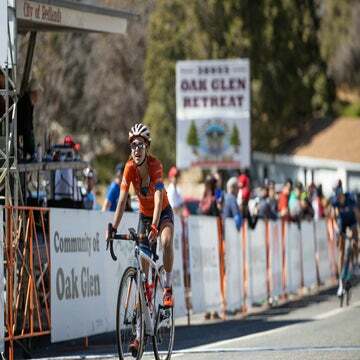 Rally Cycling roared onto the international scene in 2017, winning two stages of the Amgen Tour of California and nearly every major race on the domestic U.S. calendar. After the season the squad upgraded from the UCI Continental level to the UCI Professional Continental level and plotted a major 2018 racing campaign in Europe and the Middle East. For Aaron, McNulty’s ride carried an added weight — it brought him one step closer to his dream. 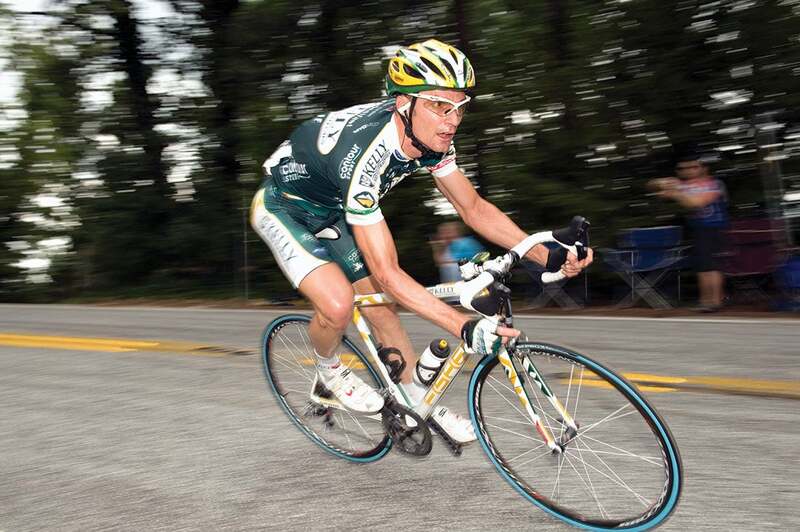 Nearly two decades ago Aaron developed a business plan to one day take an American cycling team to the Tour de France. At the time — this was the mid-2000s — Aaron struggled through the most challenging period of his life. He was broke. His marriage crumbled. He moved back in with his parents to care for his sick mother. For years, Aaron refined the plan for his hypothetical cycling team, pitching it to investors with little luck. To earn cash, Aaron parked cars at a Hyatt in downtown Baltimore. “I had a hundred grand in debt on credit cards when I was trying to launch this thing,” Aaron says. Spend more than an hour with Aaron and tales from those dark days will bubble to the surface; the memories undoubtedly fuel Aaron’s enthusiasm and energy around his cycling team. No matter his motivation, Aaron’s energy has driven his teams — Rally also supports a women’s program — to thrive within the infamously fickle U.S. domestic racing scene. Throughout its various iterations — the team has operated under the titles Kelly Benefit Strategies-Medifast, KBS-Optum, Optum-KBS, and finally Rally — the team has delivered both racing and financial success. Aaron has operated without the luxury of a wealthy benefactor to fund his project. Instead, he has navigated the arcane corporate strata within enormous, multi-billion-dollar companies to find champions willing to sponsor his team. And Aaron has then found ways to prove return on investment to these companies. Now, with Rally stepping into the international peloton — a move that requires a major infusion of sponsorship cash and resources — the team’s strength, and Aaron’s corporate aptitude, will be put to the test. FEW AMERICAN TEAMS AT the UCI Continental level survive more than two or three years in the sport. The economics are simply too challenging — team budgets range from the low six figures to well over $1 million. Teams compete in regional events; the exposure rarely justifies the marketing dollars spent by a sponsor. 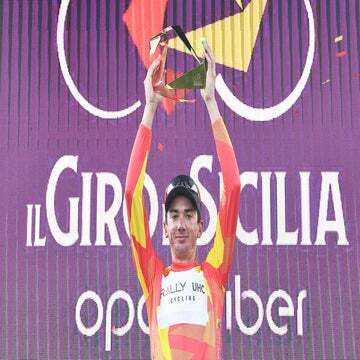 Most of Rally’s UCI Continental brethren live short lives: Toyota United (2006-’08); Rock Racing (2007-’09); Bissell (2005-’13); Fly V Australia (2009-’11); and Spidertech (2008-’12). For the select few teams that step up to the Professional Continental level, an even tougher landscape awaits. A team’s payroll can quickly double, due to UCI mandates for minimum salaries, full-time staff doctors, and race inscription fees. Access to the major European races is never guaranteed — instead, teams must impress race organizers to get a wildcard invite. Some years the invites come; other years they do not. Many teams wallow around in this no-man’s land before disappearing altogether. Aaron says he is cognizant of the hurdles before him and of the politics he faces. When VeloNews meets with Aaron at Rally’s January training camp in Calabasas, California, he recounts his experiences from the previous months. In October, he traveled to Paris to attend ASO’s unveiling of the Tour de France route. Then, just before Thanksgiving, Aaron traveled to Milan to meet with Mauro Vegni, director of the Giro d’Italia. “I felt accepted,” Aaron says. As if on cue, Aaron quickly changes tack, and hedges against any grand tour ambitions he may have. When asked if the meetings were aimed at an eventual Tour or Giro berth, Aaron downplays the suggestion. This response likely stems from Aaron’s various experiences in pro cycling. In the months prior to Rally’s breakthrough at the 2017 Amgen Tour of California, for example, Aaron was not guaranteed entry into the race. It also stems from Aaron’s commitment to “his model.” Since the team’s inception, Rally has forged its reputation around two key pillars: anti-doping and financial stability. Thus far, the model has worked. The story of Aaron’s success in the domestic cycling scene has been well documented. Aaron finally launched his team in 2007 with John Kelly, whose Kelly Benefit Strategies company offers health benefits to employers. Kelly and Aaron brought on another health company, Medifast, as a co-sponsor for its first year. Aaron hired former criterium champion Jonas Carney to choose his riders, and Carney’s talent — matched with the team’s staunch anti-doping attitude — gradually attracted some of the best riders in the American peloton. When it launched in 2007, Aaron’s team had a comparatively small budget — in the low to mid-six figures. Over time, Aaron grew the budget to well over $1 million. And the team became a feeder for top North American talent into cycling’s WorldTour. Carney attracted some of the top riders in North America: David Veilleux, Tom Zirbel, Jesse Anthony, Will Routley, Carter Jones, Chad Haga, Michael Woods, and Evan Huffman. 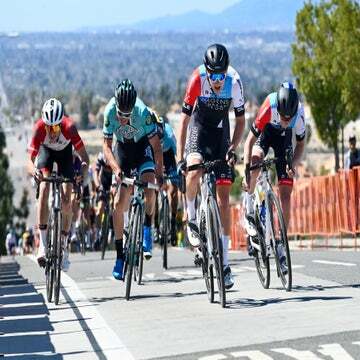 Along the way, the team became the top domestic squad in the United States: in addition to its three stage wins at the Tour of California, Rally has also won three Tour of the Gila titles, the Tour of Utah, Tour of Alberta, and a national time trial championship, among other results. And then there’s the financial stability. Behind the scenes, Aaron spent years building a marketing company, Circuit Sport, to help his title sponsor attain its promotional goals. In his first two seasons, Aaron brought on graphic design interns to produce marketing material celebrating his riders and their victories. He hired a photographer to document the team at races, and eventually replaced the interns with full-time designers. Aaron took things a step further. He hired a communications team and paid for media monitoring services to track the various stories his team generated in local newspapers and across social media. According to Kelly, Aaron’s efforts justified the sponsorship. Aaron found other ways to prove his team’s value to Kelly. His riders attended VIP events with Kelly’s company to ride with executives and potential business partners. The pro riders helped promote Kelly and Medifast as health brands. Aaron also introduced Kelly to major executives he met at local and national cycling races. Kelly said his sponsorship of the team brought him business with the youth ministry Young Life, as well as deeper business with insurance giant UnitedHealth Group, among other accounts. After a four-year run with Kelly as his title sponsor, Aaron realized that his organization had morphed from a simple cycling team into something else entirely. He employed a team of pro riders, as well as account managers, designers, and creative staff. His company had major expenses, but it was able to show real marketing return to its sponsors, specifically those with an interest in healthcare. HOW DOES A CYCLING team function as a health and wellness platform? There’s no simple explanation. Fashion brands purchase coolness by endorsing celebrities like LeBron James and Drake; an insurance or nutrition company similarly buys health and wellness through its sponsorship of a cycling team. After Rob Britton won the 2016 Tour of the Gila, a story appeared on the website RallyHealth.com about Britton’s recent change in diet. The story said Britton had replaced carbohydrates with lean meats and fats. Britton’s story now sits on Rally’s website alongside dozens of blogs and videos that focus on general fitness and healthy living. One story, written by TV and radio host Maria Menounos, discusses how to eat healthy during the holidays. There’s also a video series with comedian Kevin Hart about making fruit smoothies. Britton may seem an odd addition alongside stars of TV and movies, yet his place there forms the centerpiece of Rally’s sponsorship. In the eyes of Rally’s marketers, Britton’s status as a professional athlete — one whose entire livelihood depends on health and wellness — grants him the credibility to give advice on health to Rally customers. Launched in 2015, Rally Health is the wellness arm of UnitedHealth Group, one of the largest healthcare and health insurance companies in the world. When UnitedHealth sells health insurance to a company, Rally Health teaches its employees to be healthy through its smartphone application, website, and on-site clinics. Rally promotes the riders throughout the year in ways that Kelly did half a decade ago. Riders show up to corporate events and semi-annual Rally Health festivals, and the team hosts VIPs in its cars at major races. The team takes corporate partners on rides around the country. Rhett Woods, Rally’s chief creative officer, says the company’s use of the team relies more on its access to the riders than the actual performance of the team. Sure, the team’s success boosts its visibility and its media metrics. But promoting the riders’ healthy image presents the greatest value. Woods said that Rally Health’s reliance on the team’s healthy image is integral to the deal; in fact, the team’s performance at the Pro Continental level will not impact the agreement. While Rally may have ambitions for more European business in the future, for now, the cycling sponsorship is still aimed at American customers. Blog posts, VIP car rides, and brand building may seem like small potatoes — in truth, they are worth millions to the health brand. Rally’s executives declined to divulge the dollar amount of its investment. Aaron also declined to say. A 2015 story in the publication The Forward pegged the team’s operating budget at $4 million, however, industry experts say it is likely lower, in the $2.5 to $3 million range. Of that budget, Rally’s sponsorship payment may cover at least half of that number. A $1 million-plus cycling sponsorship — one that is driven by specific marketing goals — is nearly impossible to find in today’s U.S. domestic cycling landscape. In truth, it took Aaron years to find Rally, and the partnership came together after a series of corporate jiu-jitsu moves that Aaron executed behind the scenes. In the team’s third year, Aaron met Tom McEnery, then the chief marketing officer at Optum, the information and technology wing of UnitedHealth Group. McEnery was hesitant to sponsor a team, due to cycling’s association with doping; however, he saw cycling as a way to promote a healthy lifestyle to his employees. McEnery brought Optum on board as a minor sponsor in 2010 and gradually grew his investment. In 2012 Optum became the team’s title sponsor. Like Kelly, McEnery used the team to boost his business. At races, Optum representatives met with executives from local hospitals to pitch their services. Rally riders visited Optum branches and attended corporate events. And McEnery tracked the team’s media reach. Aaron hired on sports and entertainment company The Kraft Group to deliver detailed reports of his team’s media reach, which McEnery delivered to his bosses. 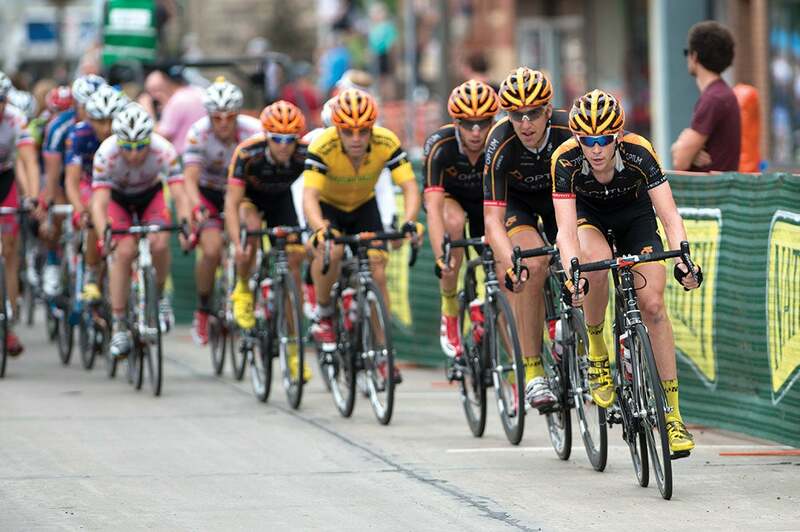 It didn’t hurt that the team dominated the races within Optum and the UnitedHealth Group’s backyard. Aaron’s team regularly won Nature Valley/North Star Grand Prix, taking the overall win six out of seven years between 2010 and 2016. According to Kelly, that was no mistake — executives from UnitedHealth Group and the company’s business partners frequently attended the event. At various UHG-backed charity events, Aaron always went above and beyond what was asked of him, bringing team cars, free bicycles, and the entire team to participate, Kelly says. In 2013, the team successfully pitched a story to The Wall Street Journal about its rider Jade Wilcoxson, who races with diabetes. Aaron even produced a hardbound coffee table book about the history of the team, which was distributed to senior executives of the company. In 2015, the decision was made within UHG to continue its sponsorship of the team, only the deal was moved away from the Optum brand to Rally Health. Kelly said each of Aaron’s moves corresponded with a critical moment within the team’s sponsorship history. Aaron’s ability to show his team’s value — through a newspaper story or a successful charity event — convinced the decision makers that the cycling team was, indeed, a worthwhile project. “Charles has always delivered,” Kelly says. “It’s the little things he’s done right over the years that added up to the big difference over time.” Aaron brushes off the praise, saying that Kelly misremembers the details around each moment. The Wilcoxson story was simply a good story; the victories at Nature Valley came because the team wanted to win; his dedication to Optum’s charity events was simply the right thing to do. Whatever victories he was able to pull off behind the scenes, Aaron says, they had no impact on the team’s survival. TWO MONTHS AFTER MCNULTY’S heroics, Rally’s young Canadian rider Adam De Vos embarked on a breakaway of his own at Malaysia’s Tour de Langkawi. On the third stage, De Vos made the early move, and then attacked his companions in the waning meters to take the stage win. As he crossed the line, De Vos thumped his chest in victory before slumping onto the hot tarmac to recover from his effort. Back home in Minneapolis, Aaron watched the events unfold on his computer screen. After the race, Aaron’s news clipping service sent him a story that credited Rally for animating the race. Those stories were then compiled into a report and shipped off to Woods, Yang, and the other executives at Rally Health.